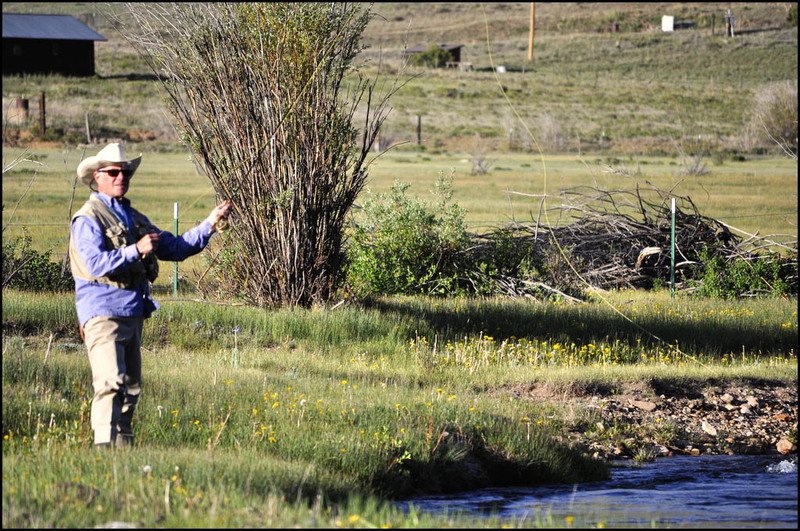 Miner’s Creek Ranch boasts four picturesque, fully stocked fishing ponds and one of the finest and most accessible high country creeks in all of Colorado. 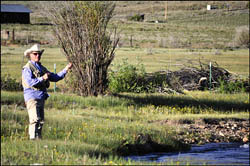 Guiding and fishery management provided by The Rio Grande Angler Fly Shop: http://www.southforkanglers.com/. The Kids’ Pond. A large pond reserved exclusively for kids twelve and under. The Kids Pond is the only part of the Miner’s Creek Fishery that permits barbed / “spinner” fishing. All young guests are welcome to fish with their lure of choice with a catch limit of two fish per child / per day. The Rearing Pond. The smallest pond on the ranch, the Rearing Pond is the perfect spot for beginning fly-fishers or for more experienced fisherman looking for a relaxed pace. The Crescent Pond. Wade midway out in the water at dusk with fish rising all around you, cast a midge as far in front of you as you can, and wait for the big ones to come to you. The Trophy Pond. The ranch’s largest pond. Ideal for pontoon or canoe fishing. The Trophy Pond is for the most patient and experienced angler interested in pursuing the biggest trout the San Juan Valley has to offer. Miners Creek. A meandering 1¼ mile stretch of crystal clear Rocky Mountain water. Miners Creek is one of the chief watersheds feeding the headwaters of the Rio Grande. 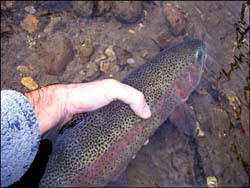 The Ranch’s section captures the stream at its largest, just before the mouth at the river and it is divided into four beats, each about 1/3 of a mile. Guests will have access to three rotating beats every day while one beat is rested. Rio Grande Access. Just a quick drive to public access quality water on the Rio Grande or an endless number of high mountain tributaries of the both the Rio Grande and the San Juan watersheds. Pick up a license and follow our directions to one unforgettable fishing experience after another or let the pros do all the work for you and try a guided river float from the Rio Grande Angler Fly Shop http://www.southforkanglers.com/.